Call for free CoolScupting consultation - Limited time offer! NEW! THE LATEST IN NON-INVASIVE BODY SCULPTING – Emsculpt® – Call now! Plastic surgery is easier and safer than ever before. Through both surgical and nonsurgical procedures (such as liquid facelifts,) New York plastic surgeon, Dr. Michelle Copeland can help you subtly change your looks in ways that will make you happier with your appearance and give you more confidence in both personal and professional settings. CONTACT US to discuss whether a procedure is right for you. Ask about options for financing through CareCredit. Dr. Michelle Copeland is the first woman plastic surgeon with Harvard doctorates in medicine and dentistry, and is the author of Change Your Looks, Change Your Life: Cosmetic, Plastic and Reconstructive Surgery and The Beautiful Skin Workout. Drawing on more than two decades of surgical experience, Dr. Copeland will make sure she understands what you are trying to achieve—and that you understand everything you can about the choice you are making. A successful outcome involves not only your looks but also your comfort and good health going forward. Make an appointment for a consultation today. Dr. Copeland will answer all of your questions and explain the options, costs, recovery and all aspects of treatment for surgical procedures such as breast augmentation, breast reduction, liposuction, rhinoplasty, and non-surgical treatments like Botox, Kybella, fillers and other non-invasive techniques. Your consultation with Dr. Copeland is the first step to looking and feeling better. Dr. Copeland now offers Advanced CoolSculpting®— a non-invasive technique to contour your body by freezing unwanted fat away with no surgery or downtime. Call today to find out how you can achieve a slimmer, more toned contour without surgery. Dr. Copeland’s best—selling book gives you the advice and perspective you need to make an informed decision about cosmetic intervention. 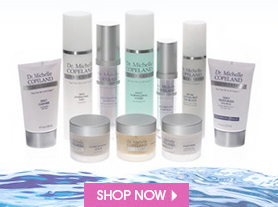 Dr. Copeland has created a full line of skin care products to meet the special needs of her patients. See how they can help you look your best! Before considering any procedure, you’ll have an individual consultation with Dr. Copeland. You’ll even see digital images of what’s possible. Dr. Copeland is quoted extensively in major print and TV media. See what she has to say about the latest issues in plastic surgery. We strive to maintain the highest level of service for our patients. To help us continually improve, please take a moment to provide us with your feedback. Thank you. Dr.Copeland was attentive to my concerns, clear about the procedure and informative about the options and the results of the procedure all I hoped it would be. Lauren was not only very competent but very caring and comforting as well. Excellent. Dr.Copeland has developed a technique that subtlely enhances and always results in beautifully looking skin. I am left with a more youthful but still natural appearance – not one that looks fake nor overdone. In addition I have been using her face products for years and I feel that the effect on my skin has been extremely positive. I highly recommend Dr. Copeland to individualize a treatment plan which will boost your natural beauty as well as your self confidence.